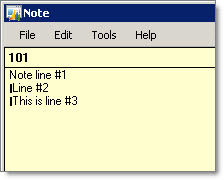 Description: When importing customer notes into GP 10 via Web Services, a client discovered that typical 'new line' escape sequences were not working properly for Notes. It turns out that Web Services handles formatting differently than eConnect, at least when it comes to new lines in Notes. Note the vertical bar at the beginning of line 2 and 3. This is a line feed character, which GP Notes do not like. In eConnect, you can use \r or vbCr to produce a new line, but in Web Services, any of the new line characters are being transformed into a CR and LF. 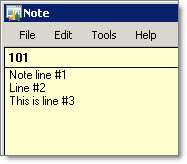 .Notes = "Note line #1 & #13 ; Line #2 & #13 ; This is line #3"
With this change, the notes are imported with proper line breaks, but without the extra vertical bar characters.